Blow Up! is a new night launching in Wigan on 19th April 2008 – and every 3rd Saturday after. 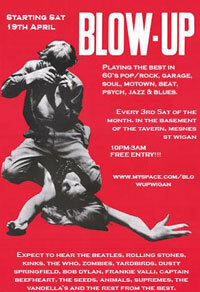 It’s at The Tavern and promises a mixed bag from the best in 60s pop/rock, psychedelia jazz, blues, soul and beat. Entrance is free & drinks promotions will be running for both ales and spirits. The night runs from 10pm until 3am. For further details about the night, venue etc, see the MySpace page below.